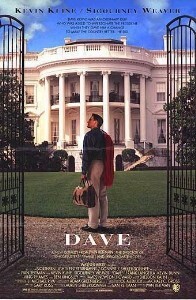 The movie “Dave” is a 1993 comedy/drama starring Kevin Cline and Sigourney Weaver. It is the story of a look-alike who was hired to substitute for “the President” one evening while the latter was “busy” in an extra-marital event. The President, obviously overstressed in his “work”, has a near-fatal heart attack, is in a coma, and Dave was convinced to continue the impersonation while unscrupulous White House officials decided on a resolution to the situation. The story evolves to the point where Dave becomes aware that things are not right in the White House (and the government) and, since he is the “man in charge”, decides to work toward straightening out as much as he can. To further dramatize the movie, there are those who try to discredit the imposter for not doing things their way. At the end of the movie the bad guys are caught, the resolution to the situation with the “real’ president is worked out, and the country is much better as the “The End” banner is dropped. I like this kind of movie where the “good guy” wins (for a change!). It has resemblance to the classic “Mr. Smith Goes To Washington” and several other similar films, but with a modern twist. More importantly, it gives the impression (perhaps falsely) that improper things in Washington, DC, and more specifically, the White House, could be corrected IF the right person/persons have a “go” at it. Gee, wouldn’t that be refreshing – someone seeing wrong things and making an attempt at fixing or exposing them. Upon arrival in DC, each new lawmaker, especially those who have no “sponsor” – someone who has political contacts there or one who has helped in your election – is treated as a “second-rate” person. You will get the smallest office at a location (in the attic or basement) furthest from the action centers. You are given the used, hand-me-down furnishings and office equipment, etc. Further, you are coached by the leaders of your own party to submit to all their requests (demands) – make no waves and offer no contradictions. To do so will provoke their wrath and will further block your attempts to be known or heard! If you obey the above then, in a year or two you MAY be be moved slowly up into the “society” there. You will be allowed to speak and voice your viewpoints, provided they align with your leaders. Go along with the “team” and you will be alright. In short, that new clean broom becomes a wet mop around your neck, and you fall into the “mode” of the Hill, sit out your first term and either do not try for re-election. OR you go back to Washington to serve another term but for your own gains, and become “one of the boys“! Think I am wrong? Well, let’s test it. We sent a number of new Congresspersons to Washington last year who had the intent to use their new brooms. Let’s watch their first-term achievements and see just how much they get done to clean out our government. See if they speak out, against the flow, in an attempt to get things done. See how many are content with their basement office and old IBM Selectric typewriters and Ford Pinto staff cars. Did we send “Daves” or “Mr. Smiths” or – who – ? Only time and the Congressional Record will tell. And, we will have recourse – – – next November 6th – – – to send them back or commission others to go in their stead. « Lawyers, Candle-stick Makers, etc.